Marvel has shared the official poster for the upcoming Dark Phoenix movie and has announced that the first full length trailer will be released tomorrow! 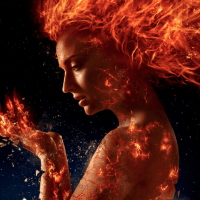 Dark Phoenix hits theatres this June. It was initially set for release in November, 2018 but was pushed back twice due to necessary reshooting and Sophie Turner’s schedule with the final season of Game Of Thrones.